Lofoten is legendary for those who have not been there and even more legendary for those who have. 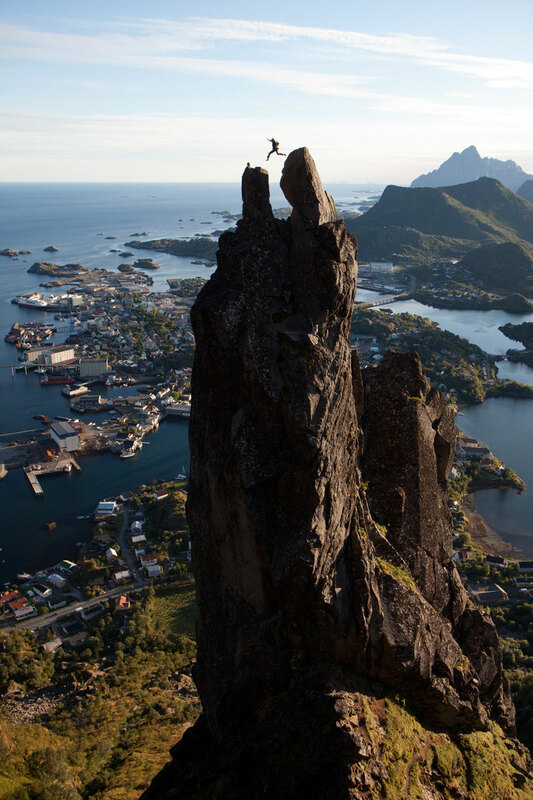 Lofoten is the place where you can forget about everyday life and experience something completely different. Nature’s effect on you is powerful and plentyful. Lofoten is the place where the sun never goes down during the summer. 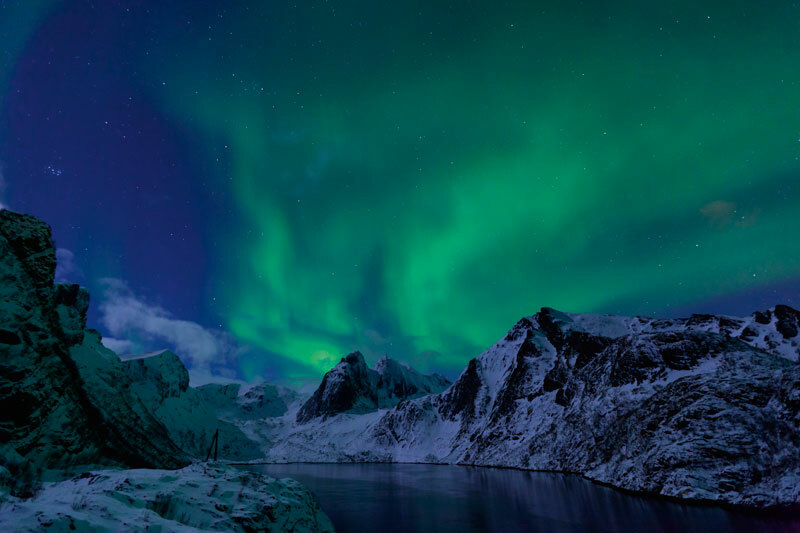 Even in the winter, Lofoten Islands shine with the northern lights and various adventures. Lofoten is where you really get close to nature, surrounded by mountains and sea. Lofoten is unparalleled as the most beautiful part of our already beautiful country. Lofoten from the seaside is something quite unique and is best experienced on a RIB. The sea can be wild, but the RIB boats are extremely seaworthy since they combine a traditional boat and a hovercraft. The aim is to excite not to fright! 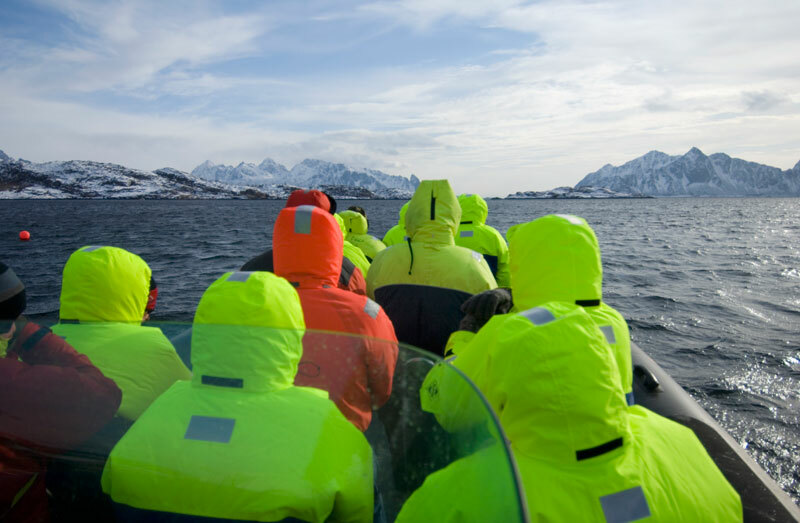 Our unique guides tell the story from the seaside and show you Lofoten from the most picturesque side — the seaside. 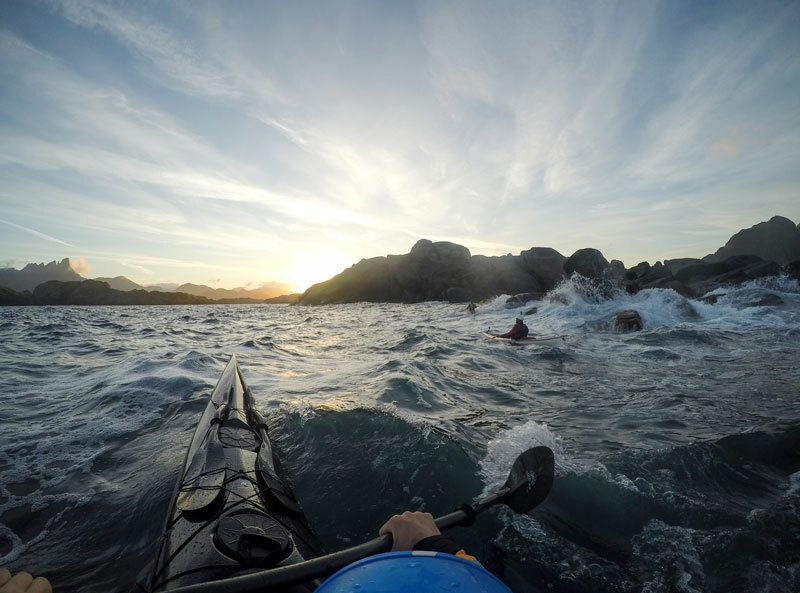 Whether the northern wind is raging from all sides, you’ll always find a sheltered place for kayaking in Lofoten. And when the nice weather kicks in there’s not much that surpasses this. You may have done it all and seen it all, but if you haven’t paddled between white beaches and azure waters in Lofoten, you still have something left to brag about. Kayaking in the special pink light that occurs late at night is an amazing experience. 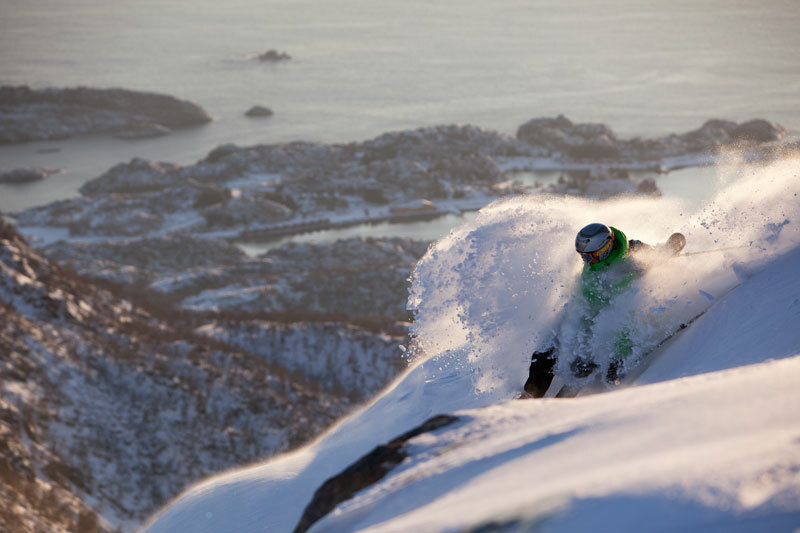 A growing number of people are discovering Lofoten as a skiing destination. 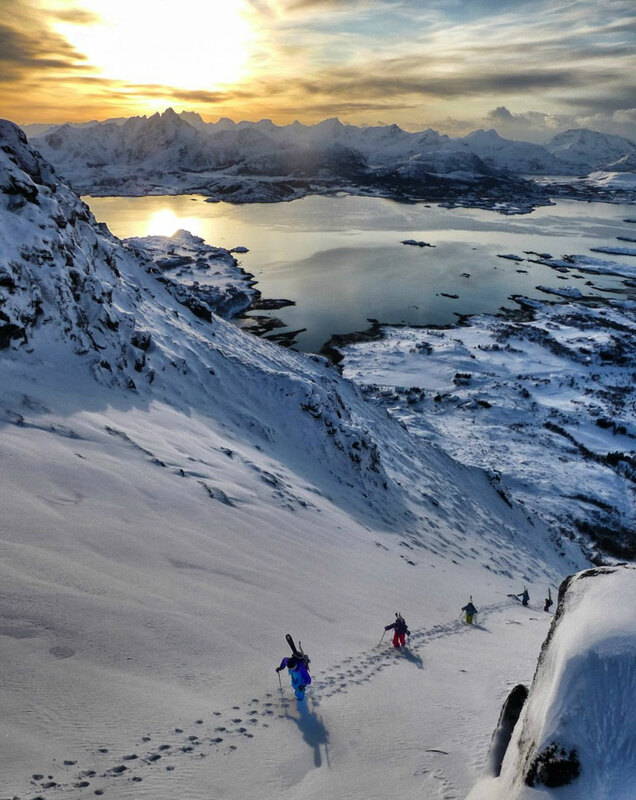 From the roof of Lofoten you can enjoy the view of sea and mountains as far as the eye can see, while you feel tingling in your legs to start rushing downhill the mountainside in the untouched snow. At the next moment you find yourself at the beachfront, breathing in the salty sea air, still wearing your skis while enjoying the sight of the mountain you just descended. Magical! We also have the option to use a RIB boat to get to the more pristine areas. We only use internationally approved mountain guides, who are well known in the Lofoten mountains. Not many golf players have tried playing at midnight. Usually it is not possible to see where the golf ball is. But not in Lofoten, in the summer time! Lofoten Golf Links is a spectacular 18-hole links course on the sea side, which is beautifully set in the landscape. The location of the golf course alongside the ocean, with great view to the north and the midnight sun is a grand experience. The ocean works as a water barrier and by several holes the beach acts as natural sand bunkers. At Lofoten Golf Links, the sun can be your companion 24 hours a day throughout the two summer months of the year. Skrei (artic cod) has had an impact on the local and the national economy for several centuries, and is still an important resource today. 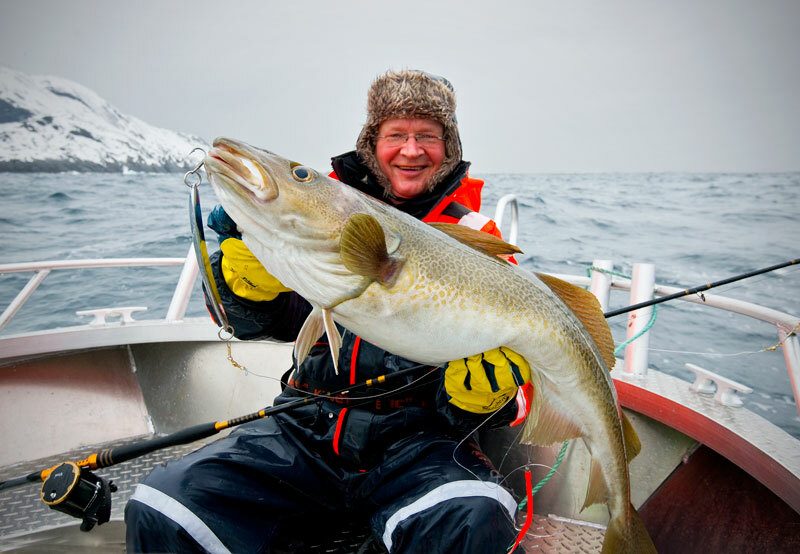 Skrei is actually considered Norway’s oldest export product. 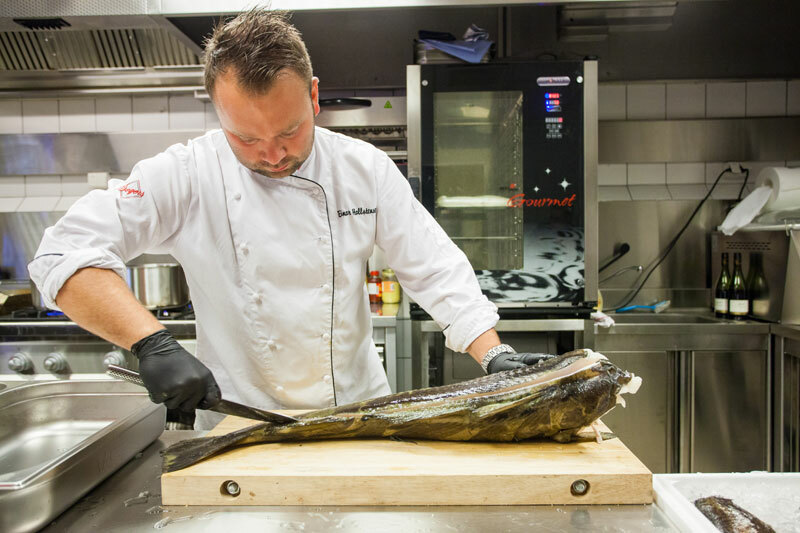 Each winter and spring, the cod swims in large quantities to the Norwegian coast and to the central areas of the Barents sea. Approximately 40 percent of the cod spawn in the Lofoten area in February to April, so we’re talking large amounts of fish. The word cod comes from the Norse word skreið which means fish that strides or wanders. 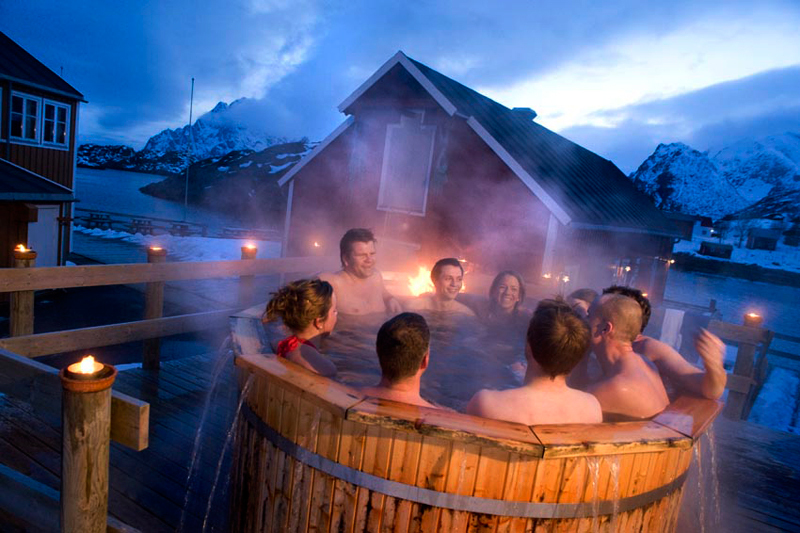 Lofoten SPA is our local ‘waterpark’ with outdoor heated hot tubs. At the pier in Henningsvær or Nyvågar, you’ll enjoy a lovely setting overlooking the ocean — often accompanied with a glass of champagne. It is an exotic experience at all times of the year. For some extra excitement – go jump in the ocean — literally. Then you get your blood pumping before jumping into the hot tub. A spa break is not complete without a delicious dinner. At the Aquavit loft you are served lovely food and you can get a taste of some of the 186 different aquavit varieties. The northern light is known all over the world. The northern lights are visible during the night when the sky is dark and the lights form rolling curtains or high pillars of smoke. The colour is bright green, often with a hint of pink along the edge, and sometimes with a dark purple core. The festival of lights lasts mostly a minute or two, and when it’s all over, most are baffled over what they have witnessed. You’re most likely to experience the phenomenon in the late autumn, winter and early spring. 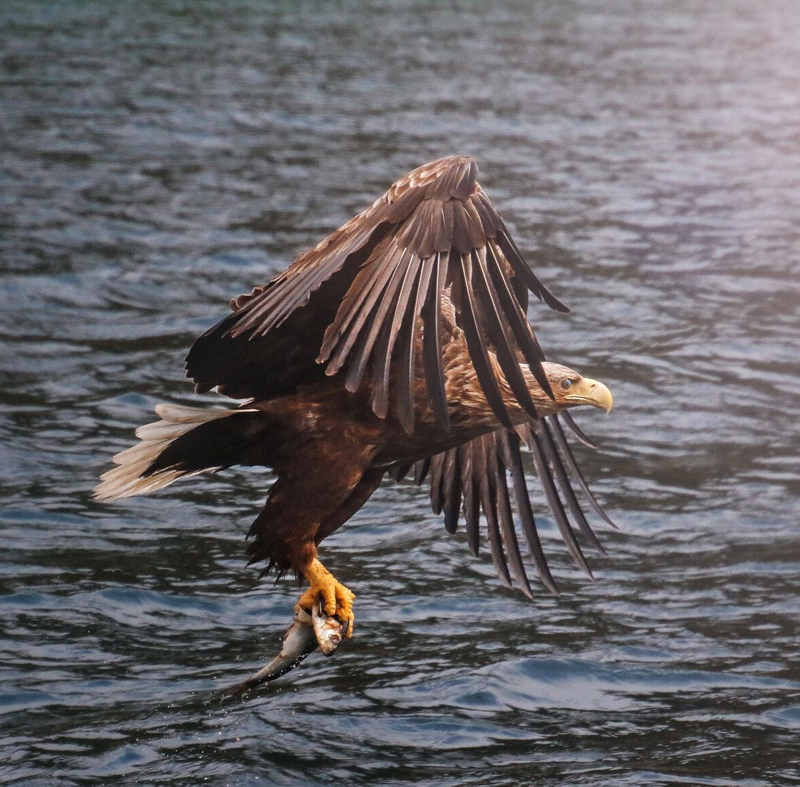 Join us on an eagle safari in a RIB or on a larger boat. We can almost guarantee eagle sightings — every time. We explore the waters inward toward Trollfjorden or around islands Storemolla, Lillemolla and Skrova. We know where we should look to find these majestic animals in free flight. The eagles are northern Europe’s largest bird of prey and the fourth largest eagle in the world — and a male can have a wingspan up to a whopping 234 cm. 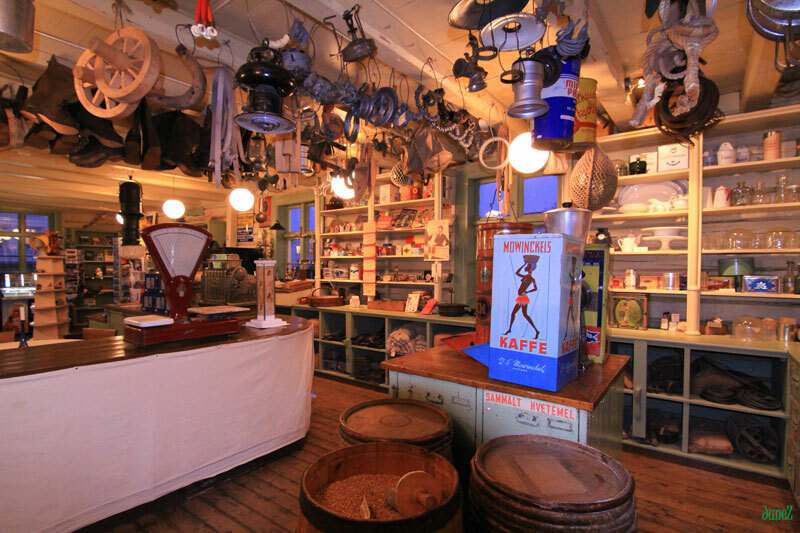 Bring your camera – here you are guaranteed faves! There are many caves of different nature and levels in Lofoten. We crawl down in mysterious and wonderful underground hollows. In the little daylight that exists, it becomes a magical atmosphere. During the polar night we light torches in the cave, making it extra special. It is narrow and cramped and you have to walk sideways, crawl and climb. In some places, big caves will emerge in front of you and give you a sense of being very small. Surfing in Lofoten takes place throughout the year, in waves that can take the breath away from even the coolest surfer. Experienced surfers from around the world get excited when huge waves from the North Atlantic crashes down with tremendous force. We also have favourable conditions for those who are new to surfing. 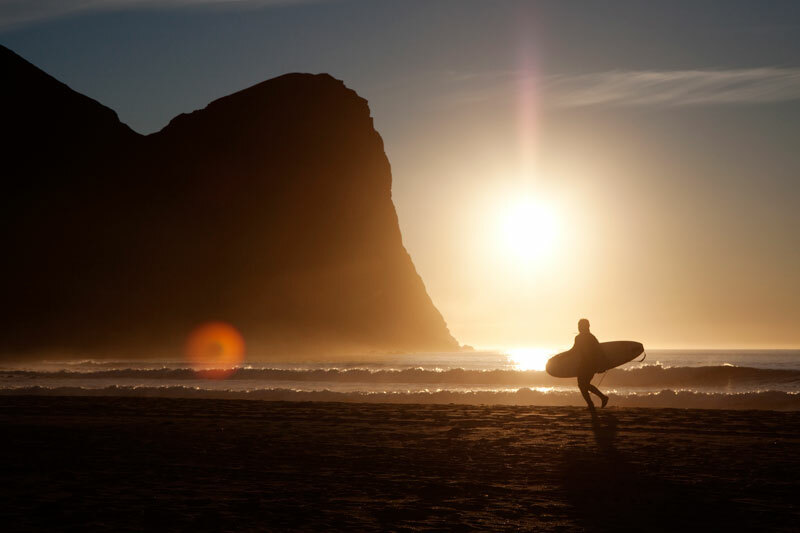 For experienced surfers, the period from August to November is the best time for surfing. For beginners, the summer time is ideal. 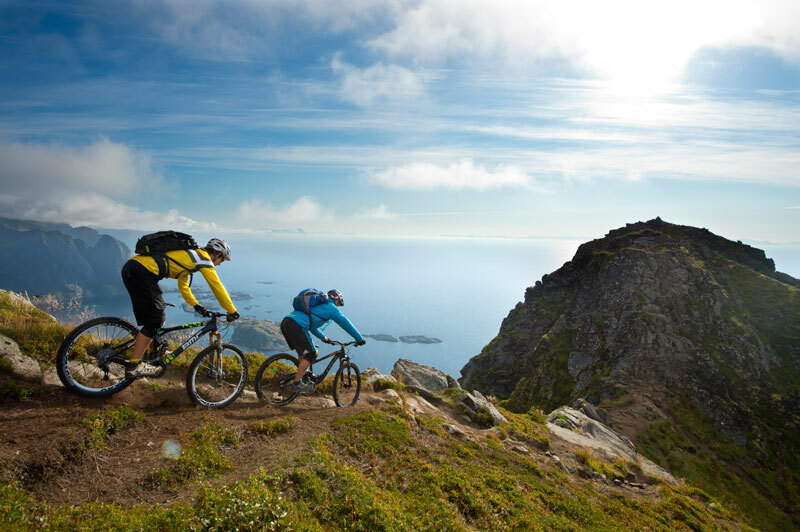 Lofoten offers great bicycle experiences. Large parts of Lofoten can be reached in flat and easy terrain. If you want to escape the traffic in the high season, there are great detour routes that avoid the Europe road, and will give you as a cyclist the opportunity to discover the small communities located a bit remote. In many of these different roads, you can even experience cycling almost completely alone in an open, peaceful and stunning landscape. 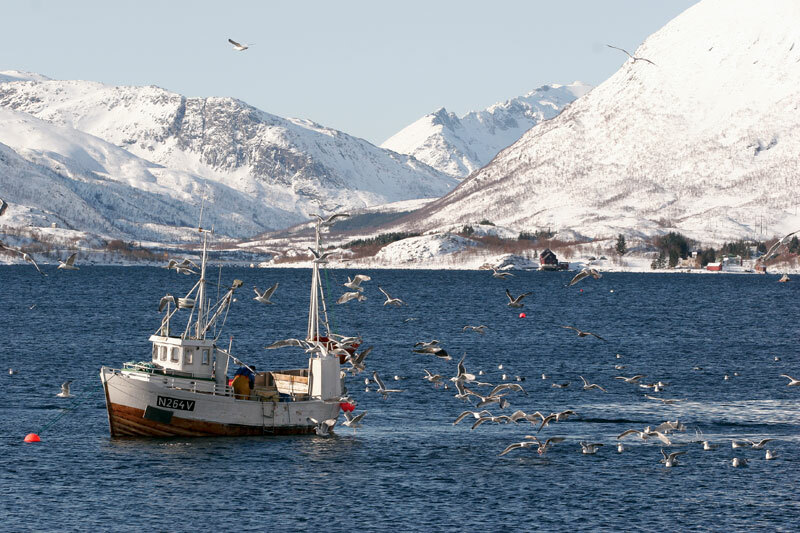 Lofoten cod fishing has had enormous significance for the Norwegian economy for many centuries. Now you can be a small part of this tradition, although under safer conditions than in earlier times. It’s no myth that everyone gets a fish to bite out on the ocean. To catch your own dinner is both an exciting experience and a world class short travelled food experience. We have trips from 150 m.a.s.l. and up to the far more demanding trips of around 1,000 m.a.s.l, on many of the fantastic mountains in Lofoten. Our trips include a guide who instructs and exchanges relevant methods and techniques, both theoretical and practical, related to the activity and experience along the way. A mountain many people want to climb when here is «The Svolvær Goat» in Svolvær. The top of this familiar and distinctive landmark is located at 350 m.a.s.l. Snowshoes is a mobile and easily «footwear» which ensures good manoeuvrability over rough terrain in the winter, providing a unique sense of achievement in a breathtaking landscape. 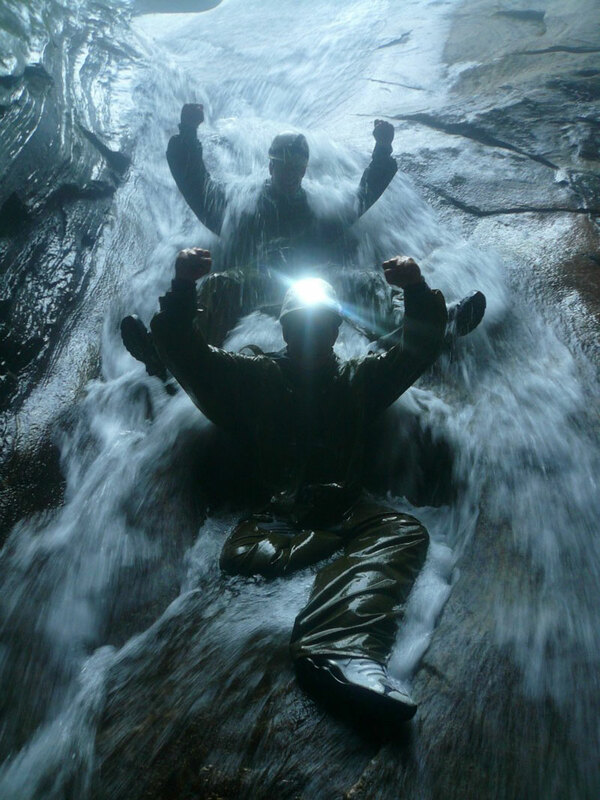 This trip includes a guide who instructs and exchange relevant methods and techniques, both theoretical and practical, related to the activity and experience along the way. 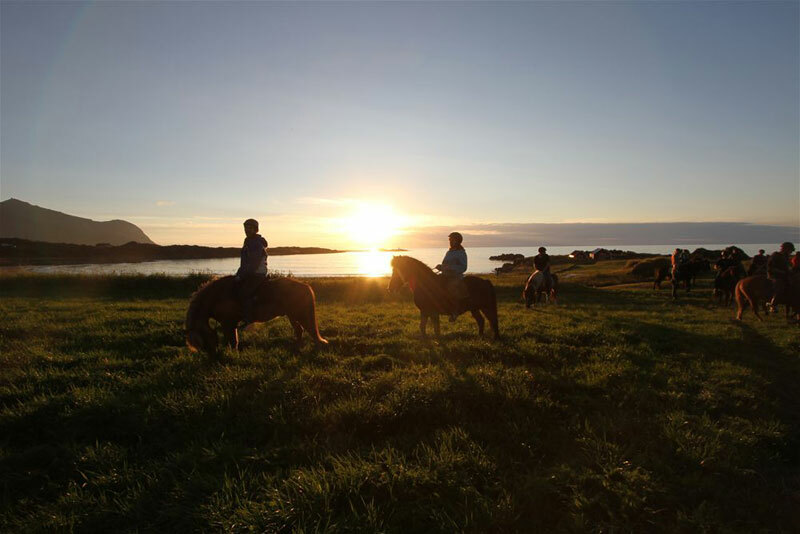 In Lofoten you can ride on the mountains, white beaches and ride on roads the predecessors to our “Viking horses” rode on over 1000 years ago. Spectacular and beautiful scenery on horseback. Both beginners and experienced riders are welcome. We adapt horse and trips to match your skills and desires. This gem of a fishing village with all its offerings and variations, tend to be a fixed highlight on our trips. Henningsvær is far more than a shabby fishing village. 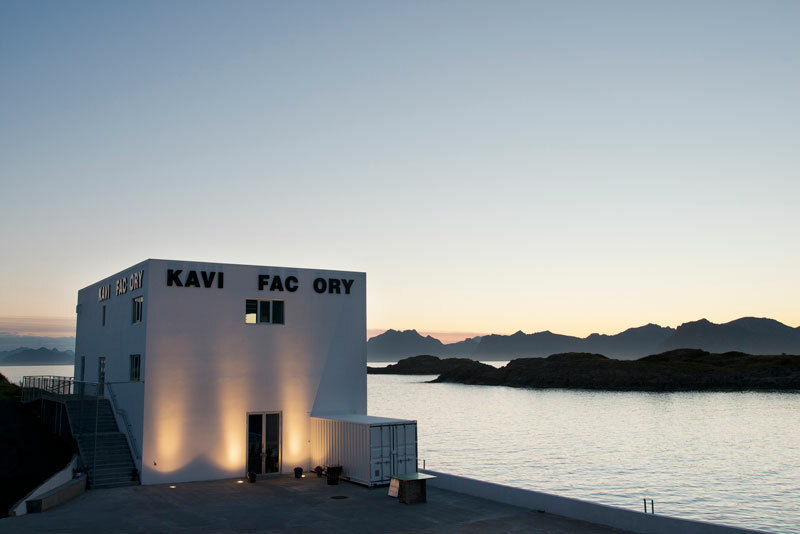 Here you find an architect designed Pier hotel, Northern Norway’s largest privately owned art collection in “Lofotens Hus”, rustic brewery bars on the quayside, craft shops which allows you to participate in production, small cafes, specialty shops and the possibility of a bath in the tub on the wharf.